The Institute for Water and Wastewater Technology (IWWT) at the Durban University of Technology (DUT) hosted the official launch of the Orange Knowledge Programme (OKP) on Friday, 01 February 2019 at DUT’s Steve Biko Campus in Durban. The OKP project is themed: ‘Bridging the water: co-create to learn and experience’, and it aims to entrench an action-learning and co-creating approach in the form of living labs for students, innovators of the University and municipalities as well as practical training of staff. It will develop sustainable knowledge transfer and cooperation amongst stakeholders, thus bridging the gaps between theory and practice, research and implementation, education and workplace as well as engineers and operators. 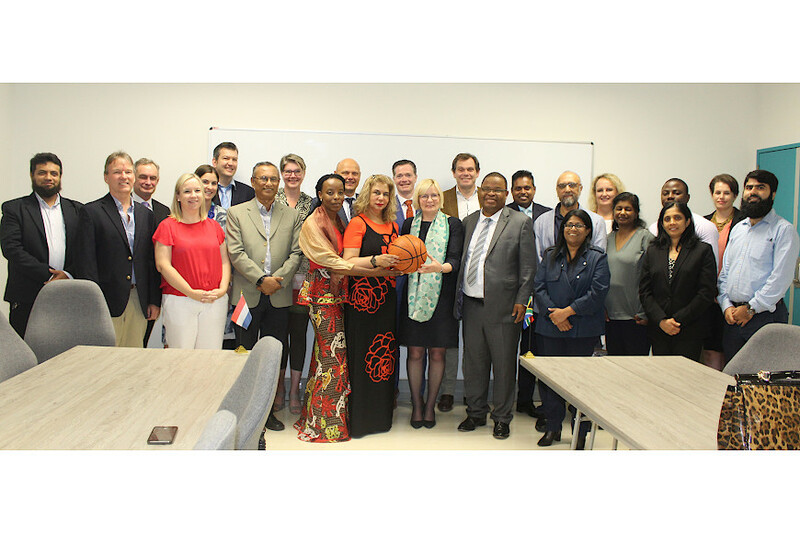 The project will be implemented in the coming years by a consortium from South Africa and the Netherlands under the leadership of the Durban University of Technology and Delft University of Technology. It is the first project in South Africa under the umbrella of the Orange Knowledge Programme. Deputy Vice-Chancellor: Research, Innovation and Engagement, Professor Sibusiso Moyo welcomed all guests to DUT and expressed appreciation to all partners for their involvement in this important project. “It really excites us as Durban University of Technology, being part of this community, to be part of this project. The Netherlands and South Africa have a long history of relations but for us this is the first collaboration project. The students we are graduating are not just graduating with a degree. As a university we have a responsibility to give them skills that can be used in the community and for employment,” she said. She also emphasised the importance of public and private partnerships. “I think the universities, municipalities and the communities need to work together to change the behaviour and attitudes in terms of how we manage waste and water. I think there is also an opportunity to look at collaboration with the private sector as well,” Prof Moyo added. Director of DUT’s Institute for Water and Wastewater Technology (IWWT), Professor Faizal Bux outlined the history, research focus areas and achievements of the Institute since its inception. EThekwini Municipality, Deputy Mayor, Cllr Fawzia Peer, highlighted the need to have highly skilled employees within the municipality that can contribute to infrastructural management in the water sector. “This partnership and collaboration with DUT is fantastic because we are now assisting our youth to acquire the necessary qualifications, which is assisting us as the Municipality with improving our skills base, but we also need to expose these graduates to practical experience,” she said. DUT and Delft University of Technology are project leaders of this project, but the consortium consists of other partners from South Africa: City of Cape Town, eThekwini Municipality, University of Cape Town, South African Local Government Association (SALGA); and the Netherlands: Rotterdam University of Applied Sciences, World Water Academy, Centre of Expertise Water Technology Leeuwarden, Waterboard Brabantse Delta). Pictured: EThekwini Municipality, Deputy Mayor, Cllr Fawzia Peer and Prof Sibusiso Moyo with representatives of the consortium partners in the Orange Knowledge Programme, during the launch of the project.